Innovative design combined with the highest quality materials and finest craftsmanship come together to create the sophisticated Avenue Montaigne Cabinet by Eichholtz. Beautifully proportioned, the cabinet top almost appears to be floating above the practical, sleek base with its linear design and nickel hardware, finished in ebony black. 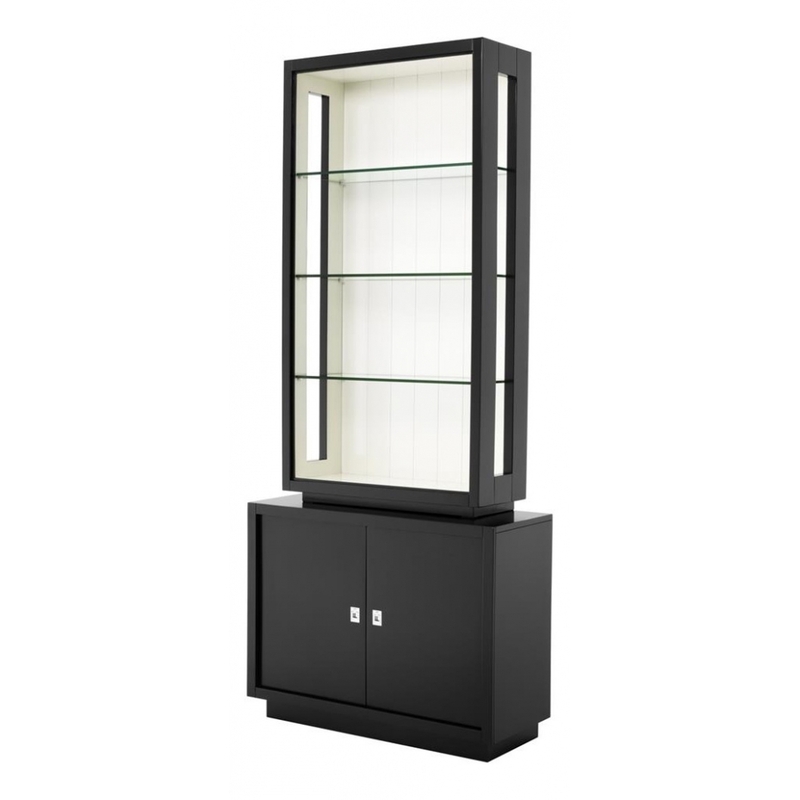 The white interior and clear glass shelving will showcase your prized possessions beautifully making the Avenue Montaigne Cabinet a great option as a display case for the study highlighting your favourite trophies and awards, or dresser for the dining room to house your most precious dinner service set. Great for hallways and hotel foyers too, the Avenue Montaigne Cabinet is both a versatile and stylish addition to a wide range of interior design schemes. Play on the ebony finish for an Oriental inspired look with Chinoiseries linens and wallcoverings offsetting carefully curated objets d’art inside the display case, or go contemporary with stripped back brickwork, sculptural ornaments and leather bound books for a New York Loft styled look. Dutch interior design house, Eichholtz pride themselves on their eclectic collection of beautiful furniture, lighting and accessories carefully selected from around the globe. Founder, Theo Eichholtz travelled the world from a young age developing a discerning eye for craftsmanship and style, and sources only the finest of the finest items to add to their luxury brand catalogue.